The ventilated back panel of the Clearwater PFD is more comfortable and less bulky when you lean back in your boat. 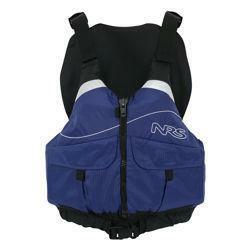 The flotation of this recreational PFD is concentrated in the front panels and up high on the back for a more natural sitting position. Eight adjustment points let you easily customize the fit. Two large front pockets provide plenty of room for storage. The left front pocket includes a lanyard for keys.